Twenty years later, a body surfaces in the icy black waters of the River Corrib. At first it looks like an open-and-shut case, but then doubt is cast on the investigation’s findings - and the integrity of the police. Cormac is thrown back into the cold case that has haunted him his entire career - what links the two deaths, two decades apart? As he navigates his way through police politics and the ghosts of the past, Detective Reilly uncovers shocking secrets and finds himself questioning who among his colleagues he can trust. What really did happen in that house where he first met Maude and Jack? 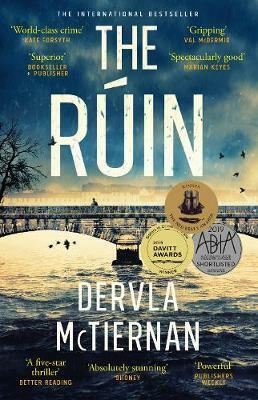 The Ruin draws us deep into the dark heart of Ireland and asks who will protect you when the authorities can’t - or won’t. If you’re on the hunt for a crime story that’s going to consume every other thought in your head, wring you out like a wet towel, and then deposit you back in the real world with your nerves fried to crisp … You’re in luck. The Rúin is the kind of book that you will inevitably find yourself recommending to every person you know, and probably also that lovely person who makes you coffee. It’s blisteringly good. The less you know going into The Rúin the better, so here is the briefest of summaries: Detective Sergeant Cormac Reilly is drawn back into one of his old cases from 20 years earlier and must contend with the unresolved trauma of Ireland’s recent history. I can also promise dead bodies, suspicious figures returned from the past, corruption in high places, clever detective work, a host of slippery secrets, and all kinds of moral dilemmas. Dervla McTiernan keeps a cracking pace as she flips between the perspective of the methodical and determined Reilly, and of talented surgical resident Aisling Conroy, who is facing a difficult decision following a tragedy. The story is set in Galway on the west coast of Ireland, and McTiernan creates a nuanced portrait of how the country’s history informs the present day and its politics. The Rúin is sure to appeal to fans of Tana French, and not simply due to the shared setting. Like French, and also Jane Harper (The Dry), McTiernan has crafted a procedural where investigative work is inexorably tangled with the mess of real lives, and the vivid world she creates is populated by characters that feel incredibly authentic. This elegantly crafted and utterly addictive novel is the perfect reason to invest in a ‘Do not disturb’ sign for your weekend ahead. McTiernan has already promised book two and I can’t wait. Bronte Coates is the digital content coordinator and the Readings Prizes manager.